The poet Tennyson and his wife came to live in Chapel (or Holyrood) House, Montpelier Row, Twickenham, in March 1851 until November 1853. He had been appointed Poet Laureate in 1850. Near by, in Northend House lived the bookseller Henry George Bohn, whilst at Kneller Hall was his friend the poet F T Palgrave. 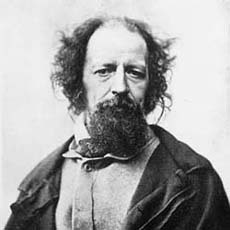 Tennyson had married Emily Sellwood on 13 June 1850 after an intermittent 20 year courtship. His son Hallam was born in Chapel House, and baptised at St Mary's Church on 5 October 1852. This son was named after Tennyson's great friend Arthur Hallam who had died tragically 19 years earlier. There was more than a trace of morbidity in so naming his son, but that was Tennyson, the man who wrote: "Break, break, break/On thy cold grey stones, O Sea!�." He began to find Twickenham too close to London, with too many visitors now that the railway had arrived. Those who were actually welcome included Coventry Patmore, Julia Cameron the photographer, Thomas and Jane Carlyle, John Everett Millais, W M Thackeray, Edward Fitzgerald, the sculptor Thomas Woolner and Robert Browning who attended Hallam's christening. He also complained of the smell of cabbages in the vicinity. He left for the seclusion of Faringford in the Isle of Wight in November 1853. Meanwhile, his widowed mother Elizabeth Tennyson moved into Chapel House. 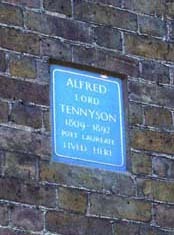 Blue plaque commemorating Tennyson's residence at Chapel House, Montpelier Row, Twickenham.